Discover for yourself the wonders of natural mattresses, and mattress covers made from natures finest ingredients. Choose from our selection of all natural and organic cotton, untreated eco-wool, and 100% pure natural & organic latex mattresses, with or without an springs. We have outlined everything you need to know to make an informed and educated choice about your mattress choice. Call us, we're happy to walk you through the process of choosing a 100% natural mattress for you and your family! At Good Night Naturals we recognize the importance of safety and comfort for a great night's sleep, yet also understand that there are other necessary ingredients. Comfort must extend beyond physical contentment, to include a healthy and safe sleep environment. When it comes to providing a holistic approach to your health, accurate information is key! What you don't know about traditional mattress materials and construction can cause harm to your health and well being, as well as that of your loved ones. The list of toxins continually being admitted into your body from chemicals and synthetics in conventional mattresses seems to grow daily. Here is a link to a very interesting 7 minute video by Dr Doris Rapp, MD Is Your Mattress Making You Sick?. Courtesy of Health Advice from www.Mercola.com. Did you know that as well as breathing, your pores open at night, and skin naturally absorbs what it comes in contact with? Because of the commercial mattress and bedding industry's reliance on synthetic materials, your family's health is at risk. Plastics, foams and polyesters—used heavily in most traditional mattresses, can emit toxic gasses that you inhale and absorb throughout the night. Commercially processed cotton is saturated in pesticides, contributing to your nightly dose of chemicals as well. See Sleeping with Danger. 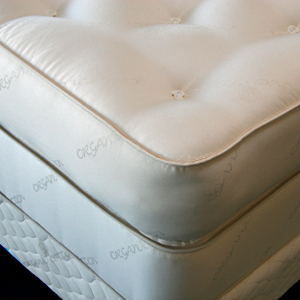 Dust mites thrive under the moist conditions of these absorbent, non-wool mattresses, and their microscopic feces are one of the most prevalent sources of bed-born allergies. 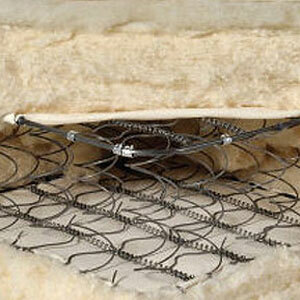 Although your mattress may feel comfortable, your health may be jeopardized by unhealthy sleeping conditions. 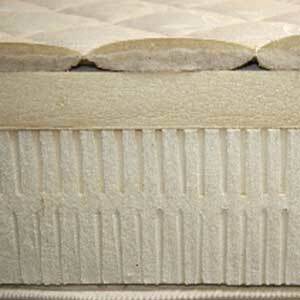 For more information on the effects of chemicals in mattresses see Synthetic Bed Mattress Health Effects Report. Because we spend more time in the bedroom than anywhere else, it's vital that you and your family have the healthiest natural mattresses available. And that's why Good Night Naturals can assist you. Good Night Naturals is committed to providing only mattresses made with healthy ingredients, no synthetic fibers or foams. 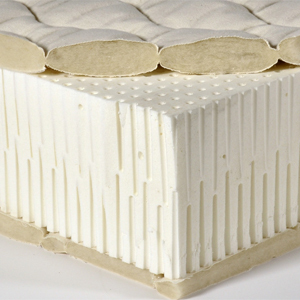 Our mattress feature ingredients that are not only healthy, but provide excellent support and are available in many a firmness that supports your special needs. Whether you’re looking for a king mattress or organic mattress covers, take advantage of our 27 years of experience matching people and healthy sleep solutions. 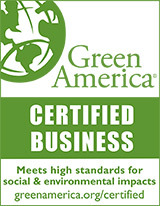 Find out even more about our non-toxic 100% organic latex, eco-wool and cotton mattress products in our Learn Pages. For ideas to resolve insomnia and other sleep issues, read 33 Secrets to a Good Night's Sleep. With so many stores and online mattress dealers making claims, how do you know who to trust? 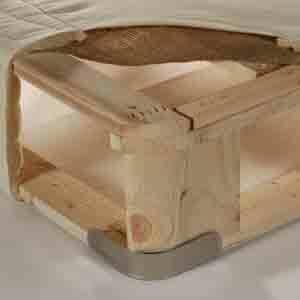 What separates a truly natural mattress from the mattress made from chemical foams, fibers and entertaining hype? Good Night Naturals is so confident in our experience and products that we recommend you ask the following questions before making any mattress purchase. Are the ingredients healthy and toxin free? Is the latex made from pure, 100% natural latex, organic latex or is it blended with synthetics or petro-chemically derived additives? Is wool built into each mattress as a natural and effective fire-retardant (if not, it should be)? Is the wool untreated and uncarbonized? Is the mattress cover made from organic cotton or a blend of synthetics such as rayon, dacron, polyester or tencel? 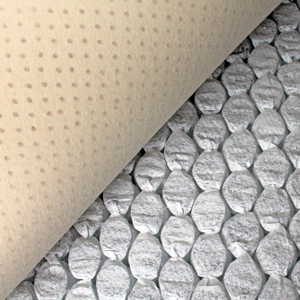 Eco-wool, a natural fire-retardant, eliminates the need for nasty chemical fire-retardants. Another benefit of natural wool is that you will experience a new level of comfort, reducing or eliminating the feeling of too hot or too cold. Body temperature can adversely affect your sleep. You fall asleep faster if your body temperature is just right, not too hot or too cold. Eco-wool works with your body to maintain a natural temperature balance, allowing you to maintain a deep and sound sleep throughout the night. Every night on your Good Night Naturals 100% natural mattress is a reminder that you’re doing something good for you body, mind and soul. Create your own personal sleep-nirvana and wake up with a clear and clean outlook ready to take on a new day.